Fall is my favorite season. The weather starts to cool down, the house smells of apple crisp and pumpkin pie, and the weekends are filled with hayrides and pumpkin patches. 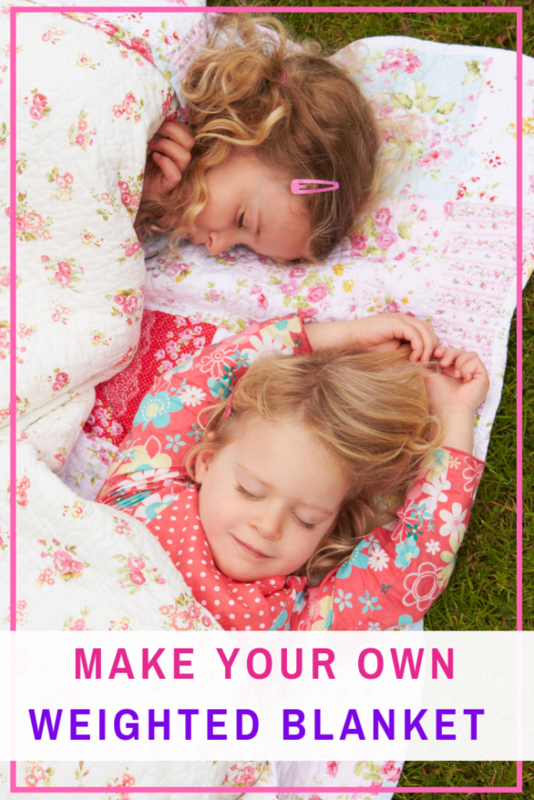 However, the fall season can hit us moms like a brick wall of chaos if we don’t have a plan and take time for ourselves. With the change of seasons also comes back to school, holiday shopping, fall sports starting back up, decorating, and so much more. So here are my fall must-haves to keep you going and enjoying all the fall favorites. A New Planner; I’m a paper to pen kind of girl so planners give me life. Some people like to start their planners in January but as a mom, I feel like our year really starts in September with back to school and back to sports. There is nothing like a new planner to keep you feeling in charge of everything you need to get done. Tea Time; When it starts to get cold outside, there is nothing more relaxing than cozying up with a warm cup of Celestial Seasonings tea. 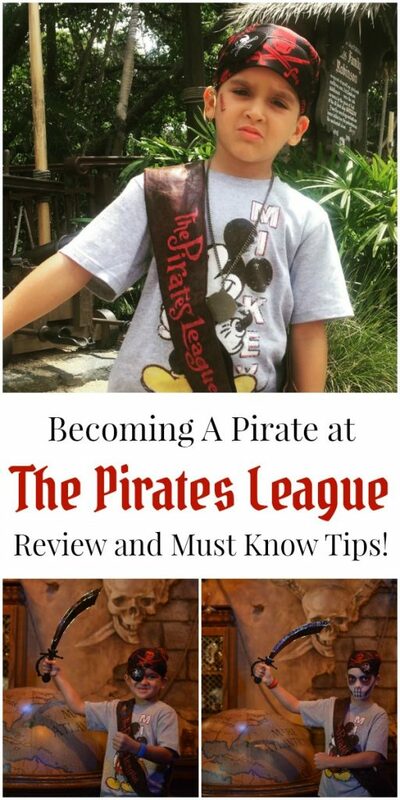 Whether I am on the couch with the kids watching a holiday movie, curling up to read a book or play a game for some mommy time, or sitting at the football field waiting for practice to be over, a warm cup of Celestial Seasonings Tea in one of my favorite flavors is the perfect way to unwind in the midst of a busy season. 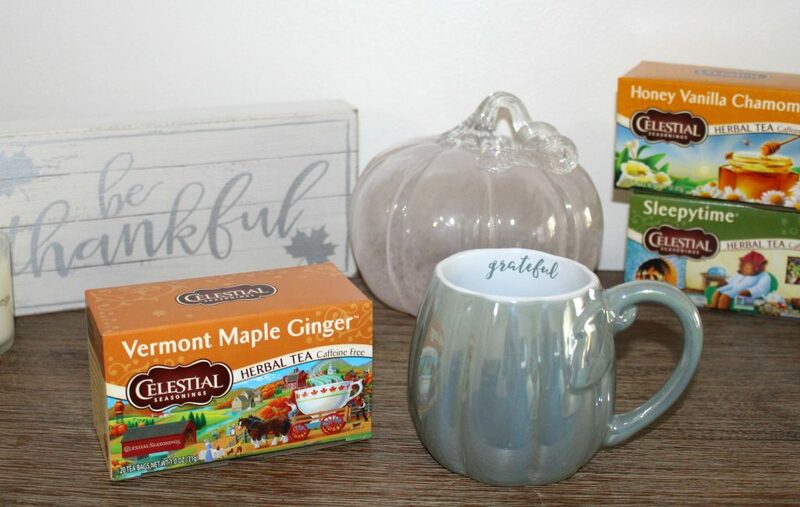 Some of my favorite flavors of Celestial Seasonings Tea are Vermont Maple Ginger and Honey Vanilla Chamomile as a delicious treat during the day, and the Sleepytime flavor is a must have during my nighttime routine. 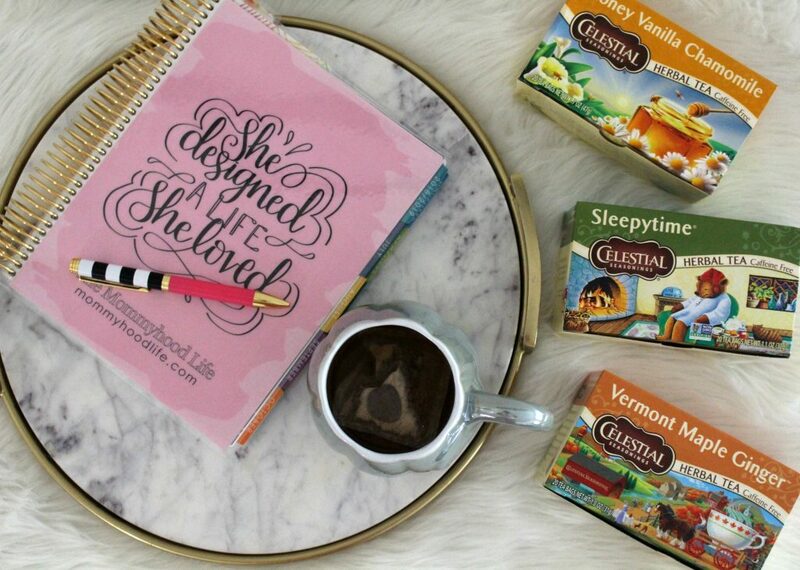 These caffeine-free 0 calorie teas keep this mommy cozy and relaxed. Fall Scented Candles; Stock up on some delicious smelling candles and you will be in the fall spirit every time you walk through your house. Plus guest will think you’ve spent the entire day baking those fall favorites while you were really curled up having a cup of tea. Easy Fall Wardrobe Swaps; It may be time to tuck away your flip-flops and sundresses but looking good on the go during the fall season can be just as easy. Grab some staples for your closet and you’ll look stylish with little effort. For me, those staples are a great pair of booties, some ballet flats, a couple of bulky sweaters, and a flannel shirt. Paired with my favorite jeans these items can take me from the pumpkin patch to a night out with friends. A Crockpot or Slow Cooker; Coming home from a busy day to a nice warm meal is great all year around, but as the weather gets colder and life adjusts from lazy summer afternoons to after-school activities and homework, a slow cooker can be a lifesaver when it comes to getting a delicious meal on the table. Plus, your house will smell delicious! Celestial Seasonings was founded more than 40 years ago with one goal: to provide delicious, high-quality teas that are good for our customers and good for the world. While all of their teas have delicious flavors, they also are leaders in sustainability. They have been located in Boulder, Colorado since 1969 blending these unique variations of teas. They strive to offer the best products and help our consumers make the best choices for themselves and their families. 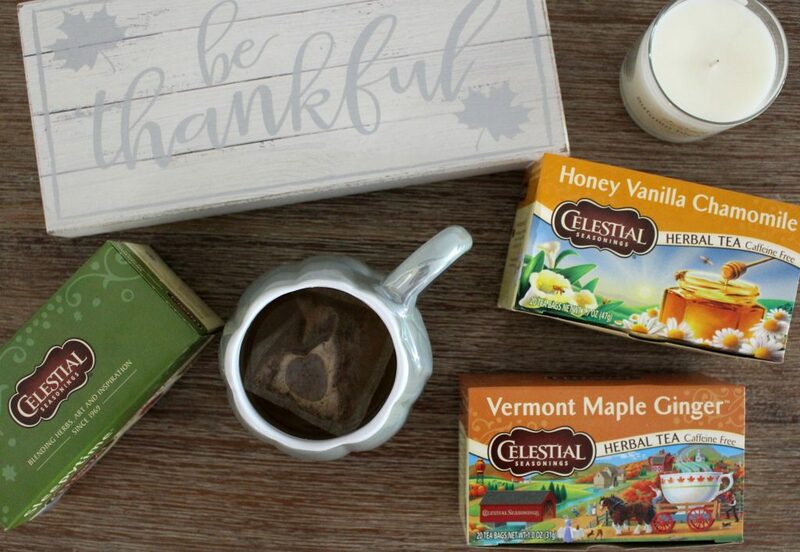 Make sure you head to your local Walmart and stock up on your favorite Celestial Teas for fall. Also, they are available for online grocery pick-up, making our mom lives even easier! 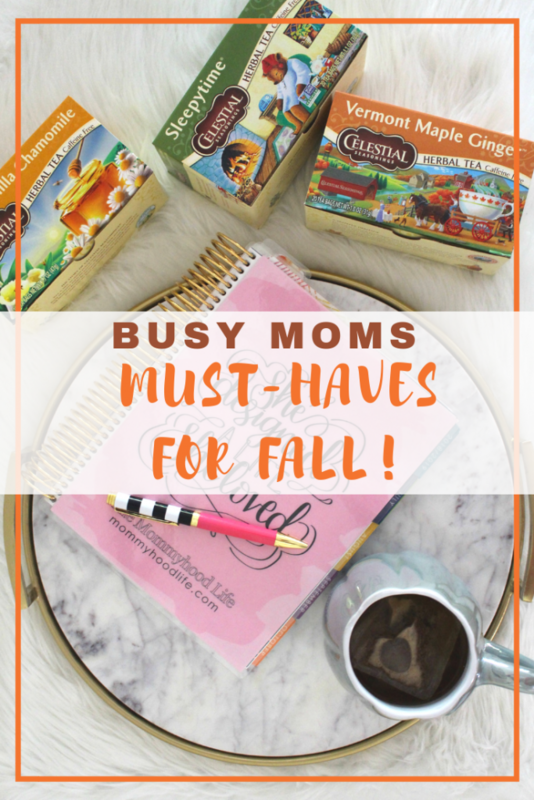 These are my top fall must-haves for busy moms. What are your favorite things for fall? I haven’t seen these flavors in the store yet. They sound so yummy! This would be my perfect late night treat! Oh yum I keep my Celestial Peach tea in full stock in my house! I put 2 bags in a mason jar and fill it up with water then let it steep in the sun! I love a good tea! I have one every morning. I need your hustle cup. Fall is my favorite time of year! So, I will definitely have to pick up these musts! 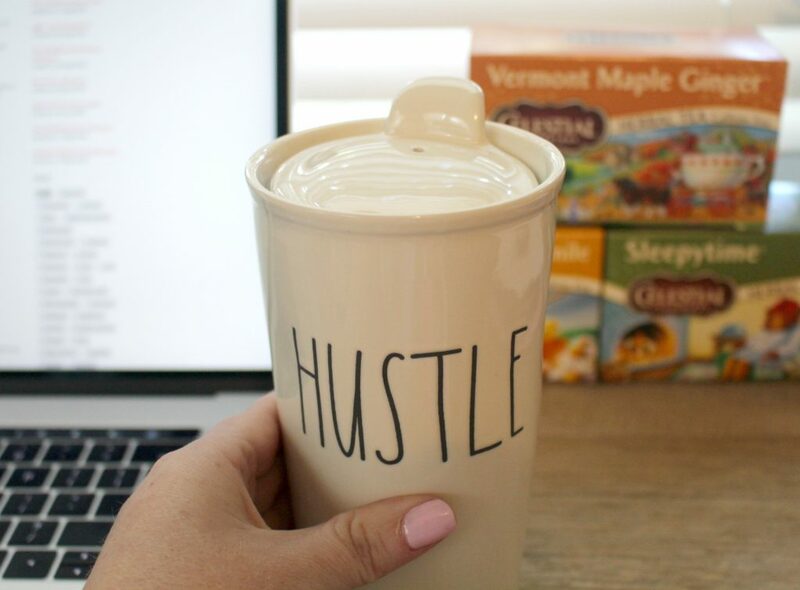 Especially that tea and mug, I love the message of “hustle” on it. I love slow cookers and sweatpants and the start of our winter swim season practice. Yes, we’re those people who associate fall with swimming pools, just as much as we do summer! I should go ahead and purchase some Fall-inspired candles! There’s a bunch at a department store near our place and they smell fantastic. Thanks for the inspo! Love your list. I still haven’t bought me some fall scented candles though. Maybe later. Happy Fall! You literally just nailed it. These are the reasons I love fall. I dont drink tea or coffee but really miss hot drinks in the colder months! I need to give these a try and see if I can be converted! My favorite things for fall is most definitely tea and my comfy blankie! I agree with all the things you listed, even though I’m an “empty nester” with adult kids who now have their own families in other states. I also have a collection of Celestial Seasonings tea, including the Vermont Maple Ginger, and several other flavors. Fall scented candles and the slow cooker also see a lot of use here.